Dimensions 1.20 by 6.40 by 9.60 in. The full inside story of the breathtaking rise and shocking collapse of Theranos, the one-time multibillion-dollar biotech startup founded by Elizabeth Holmesânow the subject of the HBO documentary The Inventorâby the prize-winning journalist who first broke the story and pursued it to the end. 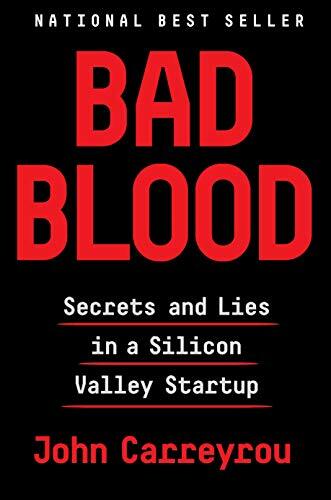 In 2014, Theranos founder and CEO Elizabeth Holmes was widely seen as the female Steve Jobs: a brilliant Stanford dropout whose startup âunicornâ promised to revolutionize the medical industry with a machine that would make blood testing significantly faster and easier. Backed by investors such as Larry Ellison and Tim Draper, Theranos sold shares in a fundraising round that valued the company at more than $9 billion, putting Holmesâs worth at an estimated $4.7 billion. There was just one problem: The technology didnât work.